I was told, there is only 1 state in Uzbekistan and that is Karakalpakstan. All others are provinces. Karakalpakstan occupies 37% of land area in Uzbekistan. It is at the northernmost part of the country, and surrounded by three deserts: the Kara Kum, Kyzyl Kum and Ustyurt. Nukus is the main town. It is the economic, administrative, political and cultural center of Karakalpakstan. It is also an unusual place for an art museum dedicated to over 90,000 works of avant-grade Russian art and artefacts from the Karakal region. Thanks to one man – Igor Savitsky who began collecting and preserving these artefacts, we can now view and understand history of this region and of the non-conformist form of Russian art better. Savitsky came to Central Asia in 1950 as part of an archaeological expedition. He was fascinated by the Central Asian region stretching from China to the Caspian Sea, and by the culture of the land. In 1966, Savitsky became the director of the Nukus art museum. 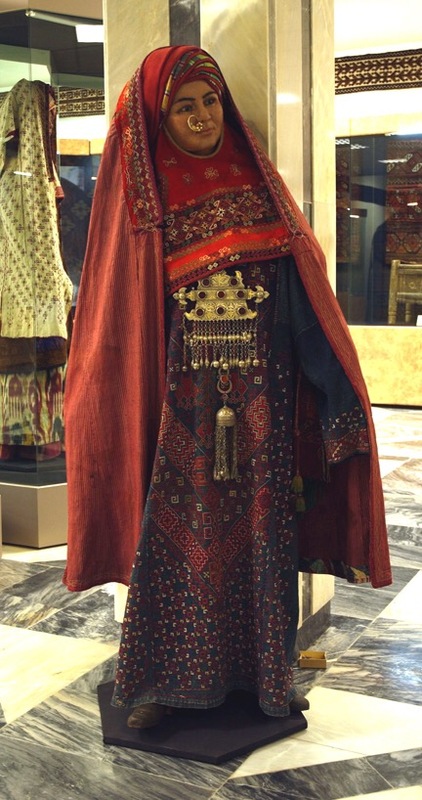 He renovated the museum’s building and roamed the villages buying traditional jewellery, clothing, carpets, artefacts, and collecting thousands of exhibits. Among these include works of art of avant-garde artists banned by Josef Stalin. These were artists whose art strayed away from what was approved by the state; some were sent to Gulag or interned in mental institutions. Vladimir Lysenko was one of them. His painting: The Bull is now the museum’s most prized work of art, widely written about and its unofficial mascot. Vladimir painted the The Bull but hid it for years fearing it would not conform to the Soviet Union’s officially approved form of art: “Socialist Realism” which glorified communist values and prohibited any form of negative representations of the state. 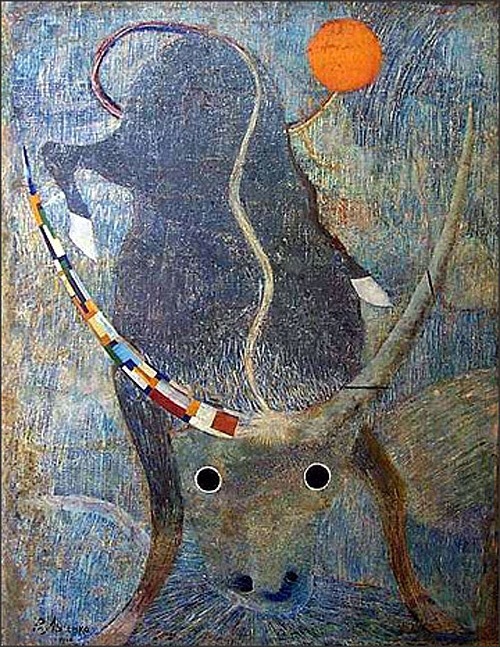 The bull in blue is seen to be charging towards the viewer with two startlingly black eyes as the focal point. When the painting was put on display, the censors saw it as a parody of the mighty USSR advancing as a raging bull; its eyes symbolic of two gun barrels expressing Stalin’s methods of repression and blindness of state; the rising sun symbolic of the Soviet Union. The painting was also known by its alternate title: Fascism Advances. The inspectors had correctly assessed the painting for its anti-Soviet meaning. Lysenko was arrested and sent to a psychiatric asylum in 1935 because – a bull can’t be blue. He spent many years in the asylum and returned “rehabilitated” in 1950s and spent the final years of his life semi-paralyzed and seriously ill in his sister’s home. The year of his death is not known. Russian avant-garde art developed alongside its Western contemporaries until the October Revolution, at which point it became an extension of the State. Stalin considered avant-garde art as bourgeois. He effectively constrained art to populist, realist, and easily understandable iterations via Socialist Realism. The State fought an escalating campaign to completely eradicate the genre of art until Stalin’s death in 1953. Savitsky played a major role in preserving that entire generation of Soviet art. Among other objet d’art include a collection of large and elaborate silver jewellery encrusted with corals from the Mediterranean. These pendants consisted of amulets to encase blessed verses from the holy Quran. Pendants in the shape of an egg to signify fertility, nose pins to signify marriage, earrings in the shape of crescent moon to signify birth of a child (crescent moon appearing like a baby) – every piece of jewellery had a specific meaning. The paintings were fascinating too. There were paintings from the past when Aral Sea was full of water. Then, just a decade later when the sea shrank, one of the artists painted a Pieta with Mother Nature cradling a dying human being. The museum also has paintings from Russian classic, impressionistic, cubism, realism. I would also like to pay a special tribute to my wonderful guide, Aysultan who had so much knowledge and patience to show me around and satisfy my inquisitiveness.